Your Grace is Sufficient: Listen! 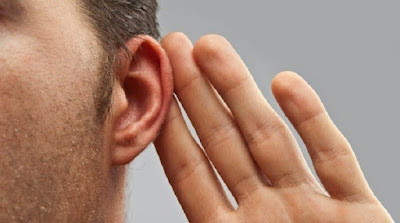 Let me start off by stating what is obvious as well as seemingly contradictory – “Listening is one of the easiest things you’ll ever do, and also one of the hardest.” In a sense, listening or at least ‘hearing’ is easy – it does not demand the same amount of effort and energy required in speaking. No one would call you a fool unless you open your mouth. But despite this ease, or perhaps precisely because of it, we often fight against it. We would rather trust in our thoughts and opinions, amass our own righteousness than receive another’s, and speak our thoughts rather than listen to someone else. Oftentimes we falsely assume that having ears equates to listening. This is especially applicable to a modern culture that is saturated with headlines, texts, hashtags, posts, ear buds, and tweets. We are swimming in a sea of words while listening to very few of them. Today’s readings remind us that Christians, following the tradition of the Jews and the Hebrews before them, are intentionally auditory. Israel was a nation of prophets, not philosophers. Prophets listen to God. Philosophers envision. For the Greek philosopher, intellectual understanding came through the eye. For the Hebrew prophet, it came through the ear. The eye sees and dissects. The ear, on the other hand, hears and obeys. The Hebrews began their scriptures by saying that God spoke and all came into existence. The most fundamental statement of the Law (Dt 6:4), begins with the Hebrew word, “Shema” translated as “Hear” or “Listen” or “paying attention.” The logic of the Hebrew scriptures is the logic of revelation and in the logic of revelation, the most illogical thing is to refuse to listen to the Voice of God. It is interesting to note that the etymology of the word ‘obedience’, which comes from the Latin ‘obedire’, means to listen. In fact, the word “shema” in the Old Testament means both to listen and to obey. Perhaps, this is one of the reasons why listening is so under-rated in today’s society that places ‘doing’ or activism as the benchmark of achievement. In a “just do it” culture, the whole notion of obedience seems absurd and even anachronistic. Everything in our culture resists obedience, because we are made to feel that any loss of control over self-fulfillment is a loss of self. It’s a culture where everyone wants to be heard, so few ready to listen. Which explains the deafening noise, the shouting, the incessant bombardment of social media postings that characterises our modern culture that glorifies self-expresison. Because of the emphasis placed on freedom, self-will, autonomy and personal determination, obedience does little to suggest a good life. Obedience seems to be a suffocation of life rather than the promotion of it. Yet obedience is a core element of the story of creation as well as the story of salvation. The first lesson man learnt in the story of creation was obedience. And the first sin and every other sin thereafter, is about disobedience. Every covenant God sealed with His people, every message uttered by the prophets, were calls to obedience. And finally, obedience is also at the heart of the gospel, it was central to the life of Jesus and His relationship with the Father, but it also summarises what it means to be a Christian. Jesus not only listened and obeyed the word of God, He totally identified with it. Thus, at the end of today’s gospel, He could confidently announce that He is the fulfillment of the prophetic word. For many centuries the Jews strained to listen to the Word of God through their prophets, but then the Word came even closer. The Word became flesh. That is why the Catechism of the Catholic Church affirms that “the Christian faith is not a ‘religion of the book’. Christianity is the religion of the ‘Word’ of God, a word which is ‘not a written and mute word, but the Word is incarnate and living” (CCC 108). Today’s readings remind us that obedience is more about an encounter with this Living Word, Jesus, than about merely following rules. It is more about effective listening than blind obedience to the dead letter of the law. It means getting in touch with the voice and life of the Spirit. The three readings provide us with different levels of listening. In the first reading, we read about the reconstruction of the moral and religious fibre of a foundering nation that has lost not only its independence but also its integrity. The foundation of this reconstruction would be the Law, which is the name given by Jews to their scriptures. As they listened attentively to the words of their holy book being read by Ezra the scribe, the crowd was moved not only to tears but ultimately to worship. For them, the Law was not just a set of religious and moral rules and obligations, it was the voice of God, the God that had not abandoned them, the God who was now restoring their fortune. Thus the first level of listening is listening to God, a listening which inspires worship, a listening that inspires conversion, and a listening that demands obedience and surrender to the sovereignty of God. That is why at every mass, the Liturgy of the Word precedes, and eventually leads to and culminates in the Liturgy of the Eucharist. The second reading proposes a second level of listening. In obedience we also listen to the voice of the Church, the Body of Christ. In the face of the human heart’s tendency towards narcissism, individualism and exclusiveness more than towards the needs of the other, obedience as attentive listening to the other members of the Body of Christ frees us to live for the other and become an integral part of the family, we call Church. Obedience can challenge our worldviews and prejudices which often filters our perception of God’s will. Finally, the gospel speaks of the third level of listening – listening to the poor, the oppressed, and the marginalised. By citing a text from Isaiah, Luke attempts to explain Jesus’ mission as a proclamation of gladness for the poor, liberty for the captives, sight for the blind, release for prisoners and a year of favour for all. These categories are often regarded by the larger society as invisible, thus not deserving its attention or time. The rich and the powerful have our ears, but not the poor. Thus, the cries of the poor are a great corrective to our self-importance, selfishness and pride. If our heart’s desires are gifts from God, then listening to the cries of the poor reveals the demands these gifts make on us. Any Christian life which does not listen to the voice of the poor effectively shuts out the voice of God. Christ’s powerful words spoken to us at Mass are meant to change things, to change us, to change the hearts and the lives of all who hear them. Every mass requires more than just our attention, it demands a total investment of ourselves, it demands obedience. Unless you are deaf or hard of hearing, you should put aside your missals (and smart phones). These are useful tools to prepare for holy mass, but when the mass begins, we should put these aside. This is because reading along and listening attentively are very different activities and have very different results. In a certain way, when we read the Word during the mass, we continue to assert mastery over the word by subjecting it to all forms of analyses. But we are a people called to ‘listen.’ Now, this is much harder than reading. Listening makes us uncomfortable because we strain to listen not just with our ears but also with our hearts. Listening treats the word in a personal way, rather than just a subject to be studied. Listening is relational. Thus, we listen to God, we do not read or study Him. In listening, we make no demands of the Word – we merely listen, embrace the Word and obey. We seek not to substitute the Word with our words. But rather we allow the Word to form, challenge, comfort and finally consume us.